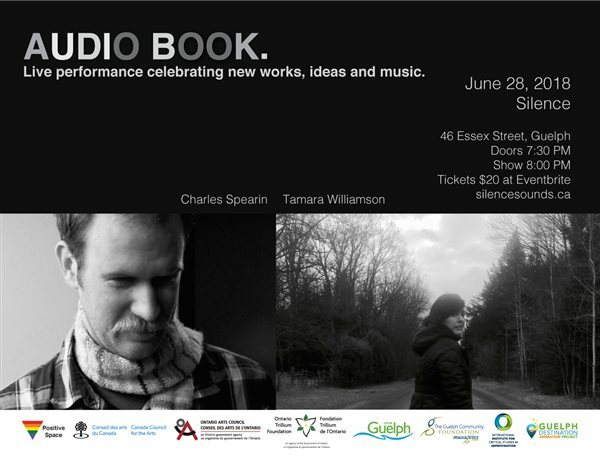 Silence: Guelph’s Portal For Adventurous New Sound Events is delighted to host a concert entitled "Audio Book with Charles Spearin and Tamara Williamson"
On Thursday June 28 at 8pm, "Silence: Guelph’s Portal For Adventurous New Sound Events" is delighted to be hosting a concert titled "Audio Book with Charles Spearin and Tamara Williamson". Both Spearin and Williamson have had active and influential musical careers in Canada since the 1990s, profoundly shaping the landscape of Toronto’s music scene. Each will be sharing new works, ideas, and music in this intimate live performance. Spearin is a multi-instrumentalist primarily known as a founding member of the instrumental post-rock ensemble "Do Make Say Think" and an original member of the indie-rock collective "Broken Social Scene". His most recent work – and first solo album – innocently titled “The Happiness Project” centers around recorded conversations with his downtown neighbours and plays with the cadence of their voices as though they were songs. More at: https://arts-crafts.ca/music/charles-spearin.html Well-known for being a member of the band "Mrs. Torrance" before embarking on a solo career in 2000, Williamson has been featured on Much Music and The New Music Show, voted fourth best concert of the year in 2003 (ahead of Greenday and behind Bjork), fronted the trip hop band Microbunny (which won the CBC new search in 2002), signed to a French label and played shows across Europe and North America. For Audio Book, Williamson will be joined by the other members of the band Mrs. Torrance, who will be playing together again with new material. Also joining will be Sarah Fazackerley, a blues/rock singer based out of the GTA. Blending instrumental music and spoken word into a moving, experimental, and thoughtful style, Charles Spearin’s work discovers and plays with the musicality of everyday life. His artistic approach borrows from his Buddhist practice to find beauty and resonance in the commonplace. For Audio Book, audiences will also hear Spearin play the nickelharpa, a traditional Swedish string instrument that combines the fiddle and the hurdy-gurdy. His stunning performance and unique approach will make the hairs on your arms stand on end. Tamara Williamson’s gentle yet commanding vocal style moves with unexpected grace, often covering subject matter that is personal, evocative, and humorous all at once. Williamson’s performance will include readings from one of her books, infused with live dramatic songs that showcase her incredible talent for storytelling and musical performance.Martin Tielli (of Rheostatics) describes Williamson as: “Someone who can take a room and transpose it onto another plane, a voice without restrictions.” She is currently a member of the Canadian Alternative Cover band AVRO, and duo ukulele project "CROW" with Patty Ewaschuk. Join them at Silence for a night of surprises.